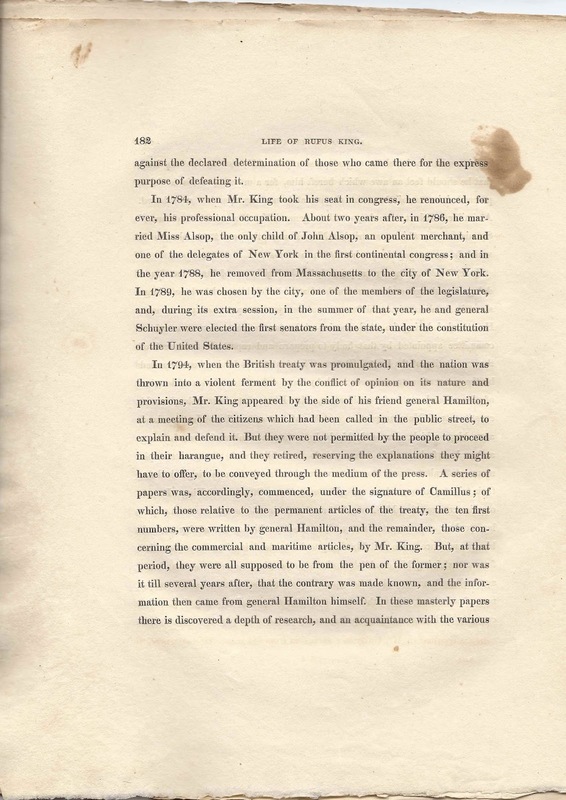 Engraving and several page biography of Rufus King, a Maine native who rose to became a statesman, signer of the United States Constitution and Presidential candidate. 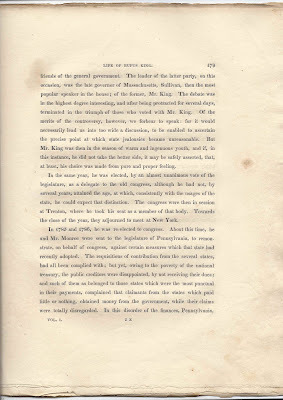 The pages were removed at some point from the 1815 edition of "Repository of the Lives and Portraits of Distinguished Americans", published by Joseph Delaplaine (1877-1824) of Philadelphia. According to paperwork that came with the pages, the portrait was engraved by Leney, from a painting by Wood, and printed by B. Rogers. The pages are 11"x 9", just a tad too large for my scanner. Rufus King was born 24 March 1755 at Scarborough, Maine, the son of merchant Richard King and wife Sabilla (Blagden) King. See a photograph of the King home at Dunstan Landing here. 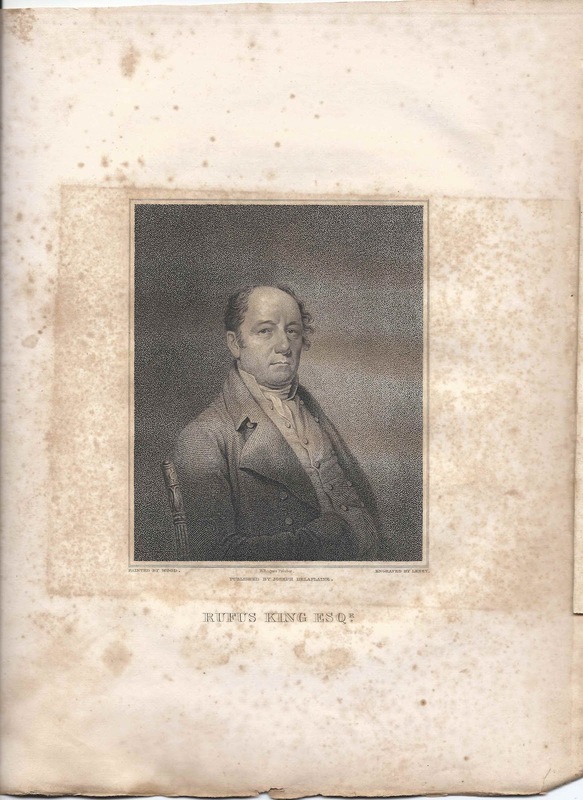 Rufus King was still alive at the time of this tribute; he died 29 April 1827. 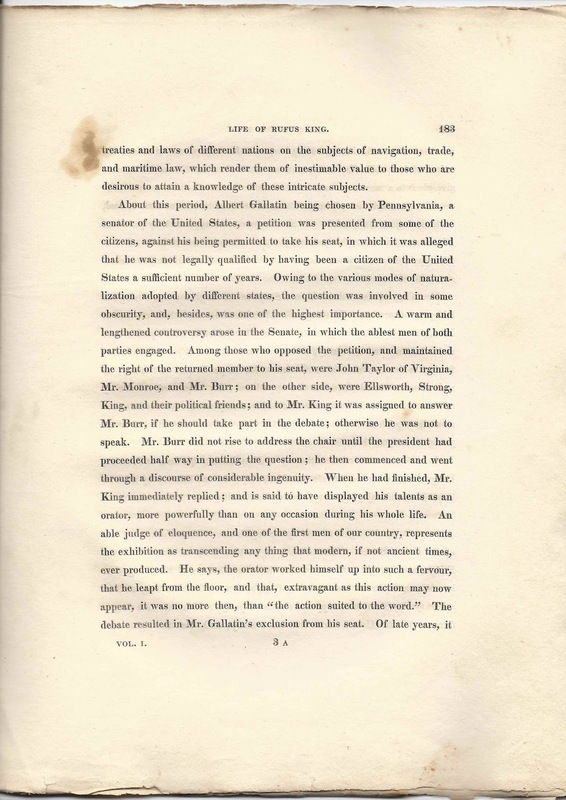 Rufus pursued his education in Massachusetts and made his life there, in New York City, in London, as Minister to the Court of St. James, and at his farm at Jamaica, New York, on Long Island. 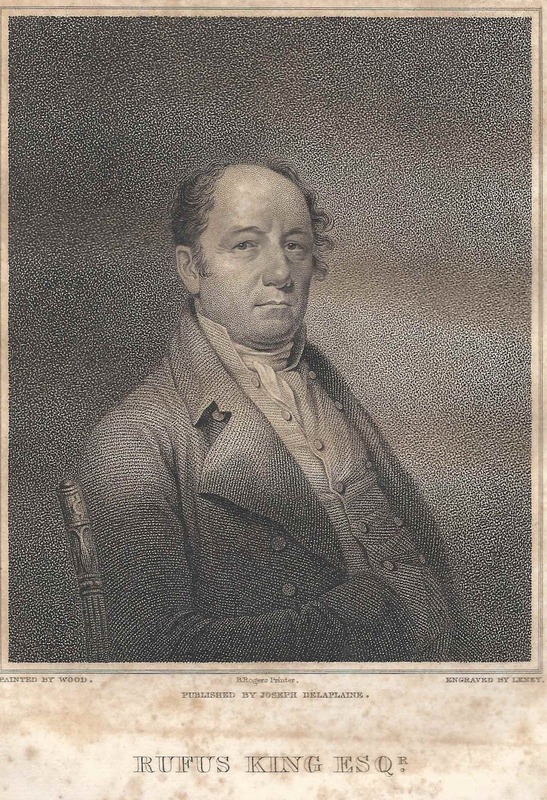 Rufus' half brother William King became Maine's first governor in 1820. His wife Mary (Alsop) King was the daughter of merchant John Alsop, who was a delegate to the Continental Congress. The King home at Jamaica, New York is now the King Manor Museum, and part of the farm is now known as Rufus King Park along Jamaica Avenue. in the cause of his country, and was one of those volunteers who joined general Sullivan, to whom Mr. King was appointed an aid, in his enterprize with Count D’Estaing against the British in Rhode Island. friends of the general government. The leader of the latter party, on this occasion, was the late governor of Massachusetts, Sullivan, then the most popular speaker in the house; of the former, Mr. King. 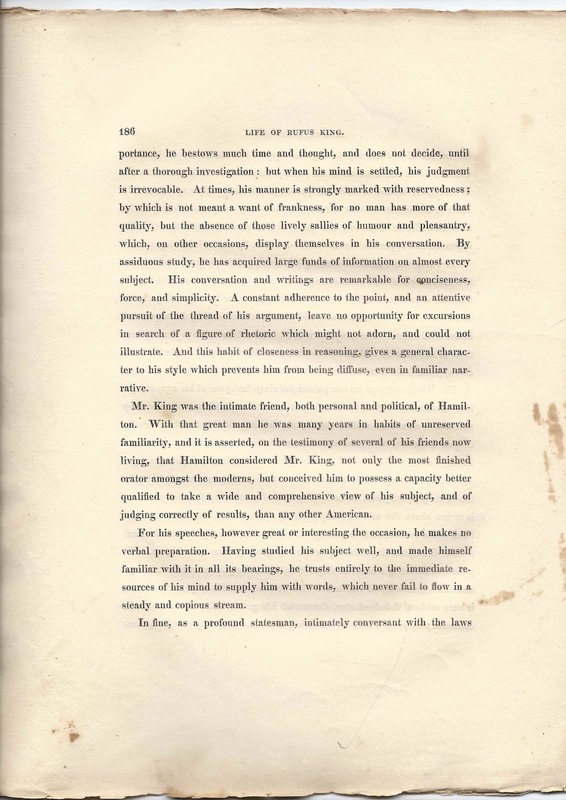 The debate was in the highest degree interesting, and after being protracted for several days, terminated in the triumph of those who voted with Mr. King. 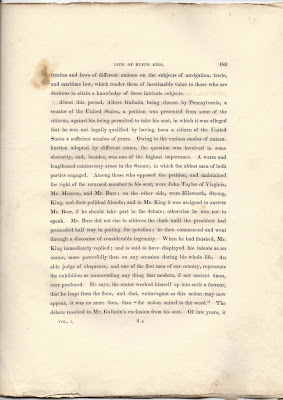 Of the merits of the controversy, however, we forbear to speak: for it would necessarily lead us into too wide a discussion, to be enabled to ascertain the precise point at which state jealousies became unreasonable. 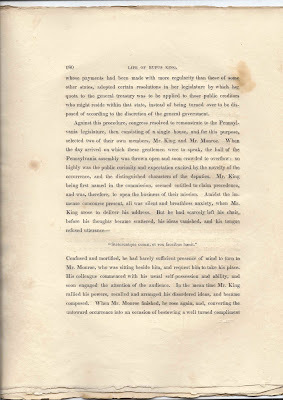 But Mr. King was then in the season of warm and ingenous youth, and if, in this instance, he did not take the better side, it may be safely asserted, that, at least, his choice was made from pure and proper feeling. In the same year, he was elected, by an almost unanimous vote of the legislature, as a delegite to the old congress, although he had not, by several years, attained the age, at which, consistently with the usages of the state, he could expect that distinction. 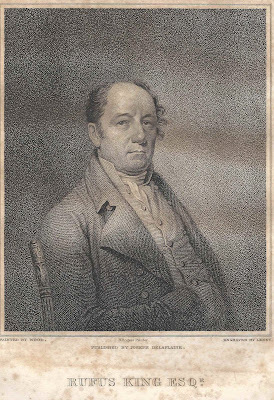 The congress were then in session at Trenton, where he took his seat as a member of that body. Towards the close of the year, they adjourned to meet at New York. 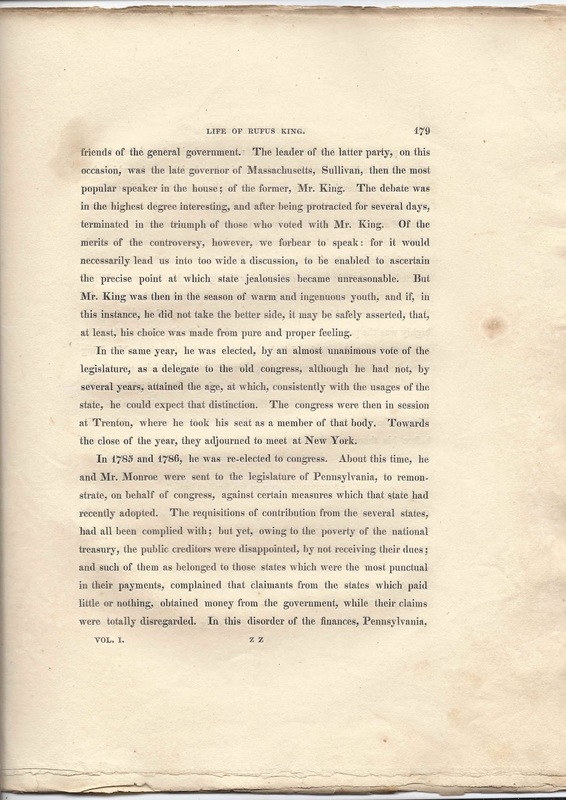 whose payments had been made with more regularity than those of some other states, adopted certain resolutions in her legislature by which her quota to the general treasury was to be applied to those public creditors who might reside within that state, instead of being turned over to be disposed of according to the discretion of the general government. "Steteruntque coma, et vox faucibus hasit." on his audience, in whose august presence, be said, it was not surprising that he should feel an awe which bereft him, for a moment, of his faculties, proceeded in one of the most elegant and masterly speeches ever heard. A similar accident once happened to general Hamilton, in the celebrated Spanish cause, which was tried in New York in the year 1794; the first in which he was engaged alter his return to the bar. 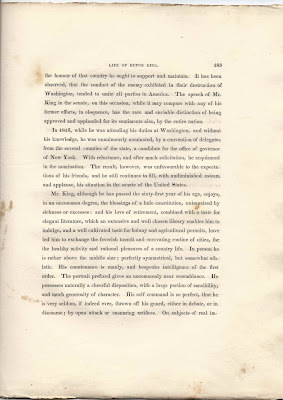 In 1787, Mr. King was appointed, by the legislature of Massachusetts, a delegate to the general convention held at Philadelphia, and he bore a large share in the discussion and formation of our present system of government. against the declared determination of those who came there for the express purpose of defeating it. Schuyler were elected the first senators from the state, under the constitution of the United States. treaties and laws of different nations on the subjects of navigation, trade, and maritime law, which render them of inestimable value to those who are desirous to attain a knowledge of these intricate subjects. parties engaged. 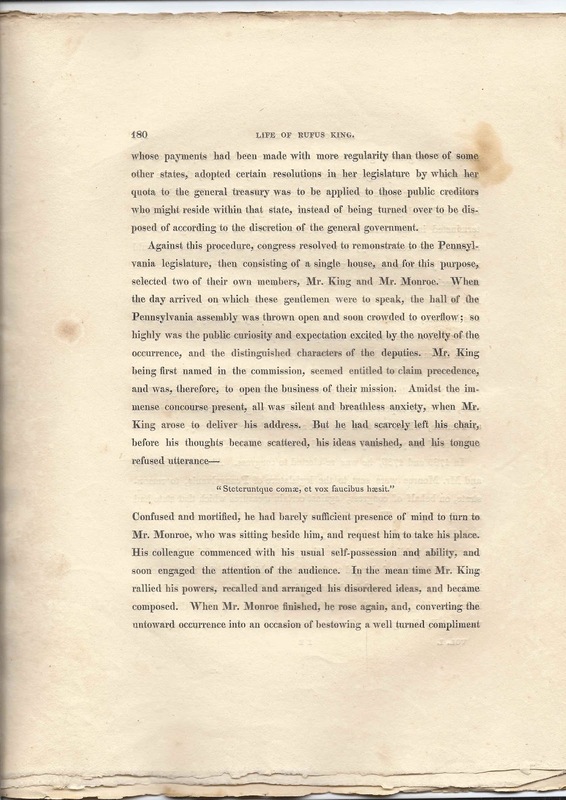 Among those who opposed the petition, and maintained the right of the returned member to his seat, were John Taylor of Virginia, Mr. Monroe, and Mr. Burr; on the other side, were Ellsworth, Strong, King, and their political friends; and to Mr. King it was assigned to answer Mr. Burr, if he should take part in the debate; otherwise he was not to speak. 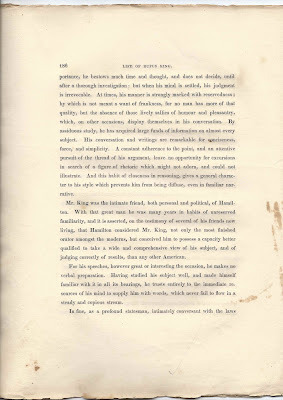 Mr. Burr did not rise to address the chair until the president had proceeded half way in putting the question; he then commenced and went through a discourse of considerable ingenuity. When he had finished, Mr.
has been observed, that Mr. King has, with few exceptions, chastised the ardour of his public discourses, and has made the animation of his manner give place to a more calm and dignified moderation. After the expiration of his first term of service, he was re-elected, and, in the spring of 1796, while yet in congress, was appointed by president Washington, minister plenipotentiary to the court of Great Britain. Before this appointment, the department of state had been offered to him, as successor to Mr. Randolph. of literary men, and has since maintained a correspondence with some of the most distinguished civilians of the old world. After an absence of seven years, he resigned his mission, and returned home in 1803. In 1808, he removed from the city of New York to his farm at Jamaica, Long Island, where he has since resided, respected and beloved by all who know him, and enjoying every blessing that health, ease, and opulence can bestow. the honour of that country he ought to support and maintain. 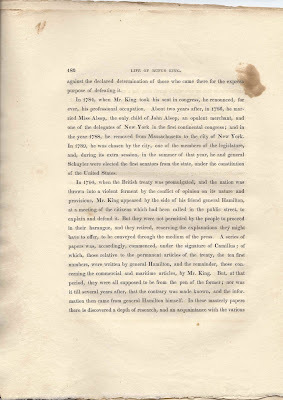 It has been observed, that the conduct of the enemy exhibited in their destruction of Washington, tended to unite all parties in America. 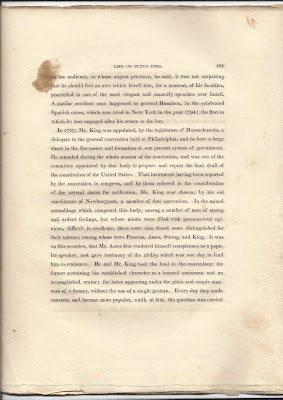 The speech of Mr. King in the senate, on this occasion, while it may compare with any of his former efforts, in eloquence, has the rare and enviable distinction of being approved and applauded for its sentiments also, by the entire nation. in the nomination. 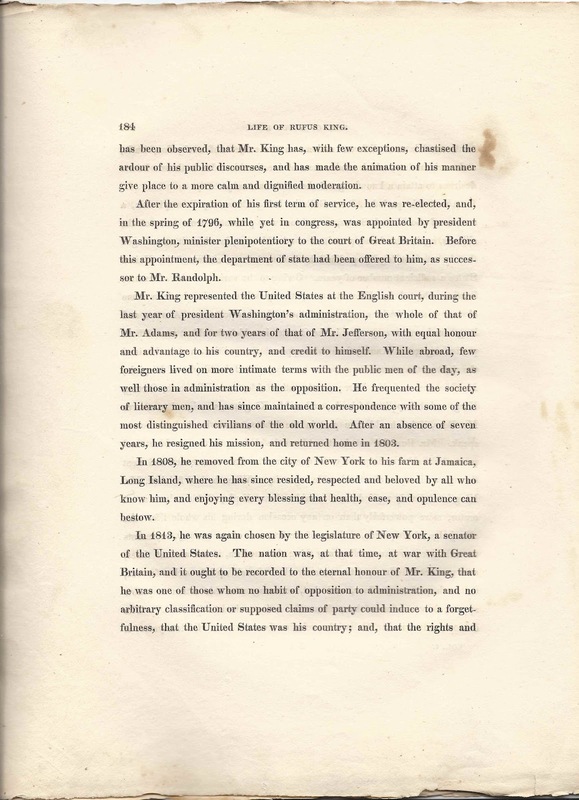 The result, however, was unfavourable to the expectations of his friends, and he still continues to fill, with undiminished esteem and applause, his situation in the senate of the United States. illustrate. And this habit of closeness in reasoning, gives a general character to his style which prevents him from being diffuse, even in familiar narrative. 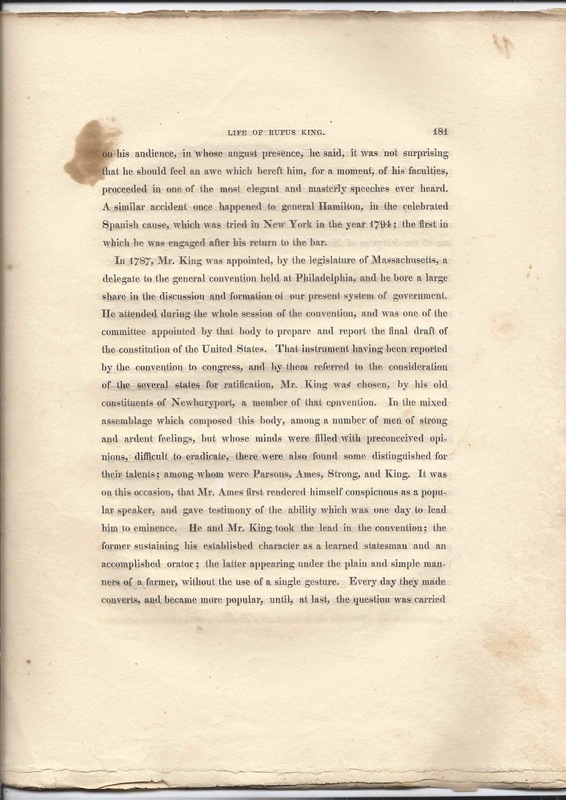 Mr. King was the intimate friend, both personal and political, of Hamilton. 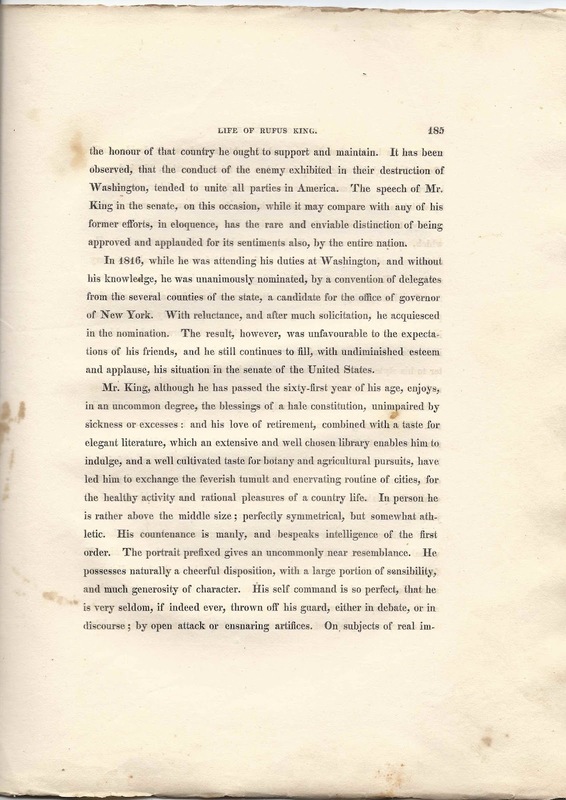 With that great man he was many years in habits of unreserved familiarity, and it is asserted, on the testimony of several of his friends now living, that Hamilton considered Mr. King, not only the most finished orator amongst the moderns, but conceived him to possess a capacity better qualified to take a wide and comprehensive view of his subject, and of judging correctly of results, than any other American. For his speeches, however great or interesting the occasion, he makes no verbal preparation. Having studied his subject well, and made himself familiar with it in all its bearings, he trusts entirely to the immediate resources of his mind to supply him with words, which never fail to flow in a steady and copious stream. 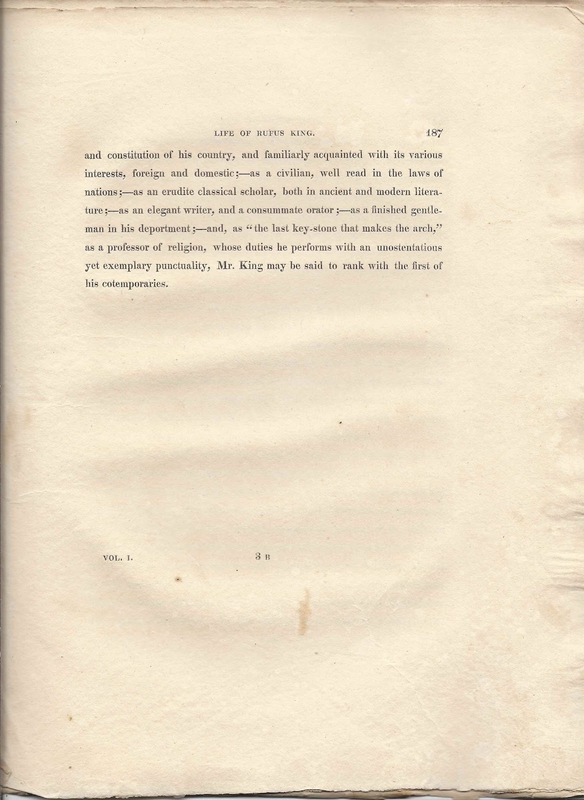 yet exemplary punctuality, Mr. King may be said to rank with the first of his contemporaries.